of supplies and common sense ideas to protect your forever pal. Avoid bites. Use a muzzle, nylon leash, gauze, belt, etc. buildings, swim in fast water, etc. In a car accident, use gloves where blood is present, blood may be human. 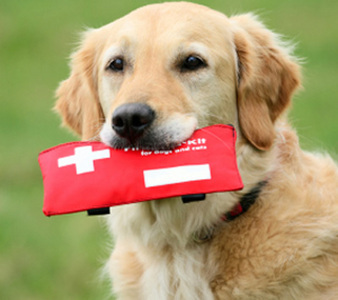 www.petfirstaidonline.com Online pet first aid course. Call your vet, emergency vet or poison control. Save any packaging, and bring with you to the vet. product. Read the package label, and ask your vet first. Transport as soon as possible. not worry about splinting or bandaging unless there is an open wound. transported as soon as possible. Severe vomiting or diarrhea, do not give oral medications, transport to vet. Respiratory distress, transport to vet. stairs, etc. Call your vet, and transport for exam ASAP. Give Benadryl 1 mg/lb (1 25 mg capsule for a 25 lb dog). venomous snake bite, transport ASAP. Apply cool water, alcohol or ice to body, especially inside of thighs/groin. Toe nail bleeding-Kwik stop or corn starch can be applied. Watch for biting. Cats: Indoors, Outdoors or Somewhere in Between? deal with all the situations they can encounter outside on their own. spilled auto chemicals are other dangers cats face outdoors. the tether gets twisted around plants or furniture. because you can easily control your cats’ access in either direction. door lets you get in easily to clean and get to the cats if needed. Places to snooze in the sun make the yard a place the cats want to be. Your cat yard should have plenty of comfortable sleeping spots. and soft soil or sand that could be scraped away by a busy paw. inexpensive. There are commercial versions available, too. selling kits or completely installed enclosures. cat-safety issues at your home, just give us a call!